Continuing with our dedication and passion for deep excavations, we continue our research and development and we are excited to introduce new unique features that extend the software capabilities. 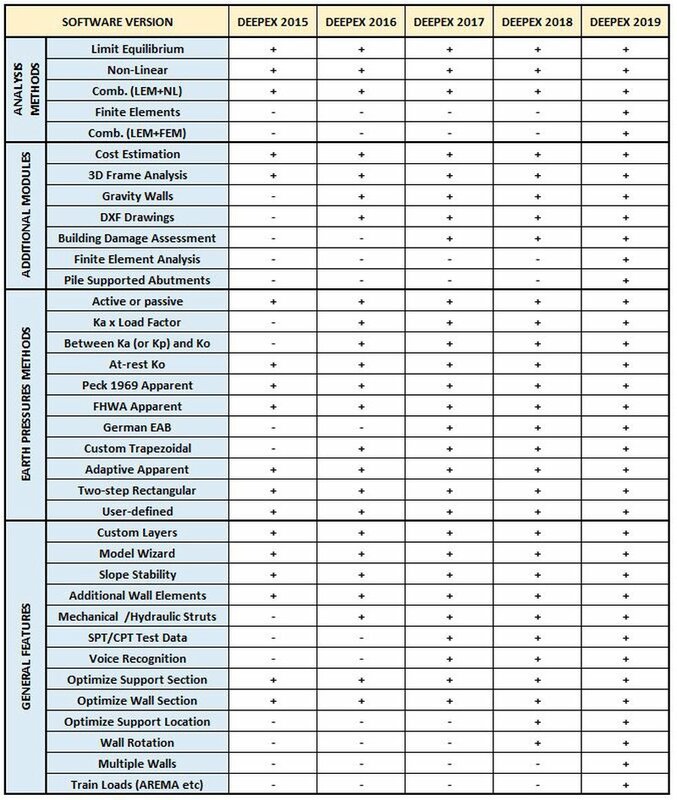 Here, we present what software features have been added and improved throughout years in every DeepEX software program version since 2014. At Deep Excavation LLC, we always try to keep our software programs updated and enhanced to the latest scientific methods and design codes, as well as, we are committed fix any possible issues that might appear. Developing such a user-friendly software program for geotechnical design and analysis, with many estimation tools, graphical interface and verified accuracy, is a sophisticated procedure. In DeepEX we combine the latest scientific methods in geo-engineering practice with unique personal engineering experience. We are grateful for all our customers that support us all these years and their feedback is very much appreciated. The following paragraphs present most of the new features that were added in each software version and newly released additional optional modules, as well as, the major fixed issues throughout the years. Apart from the mentioned major changes, each and every year we include some minor changes that target to make the software more user-friendly and powerful. Model train and train embankment loads directly with AREMA and other methods. Multiple walls and multiple stepped walls. DXF drawings for plan views, elevation drawings to DXF. From plan view and 3D model, export drawings to DXF. Elevation drawings options. Improved all project types and models generated with the Model Wizard. Import elevation survey data into 3D Frame Analysis Module. Added features to the 3D Frame Analysis: Load rebalancing, automatic generation of struts for complex wall perimeters. Improved HoloDeepEX (holographic representation of 3D models created by DeepEX 3D Frame Analysis module). View buildings and adjacent pile foundations in 3D and virtual reality. Updated Sheet pile section lists. New Module: Finite Element Analysis (to be released in February). New Module: Pile Supported Abutments. Improved speech recognition commands and interactions. DXF drawings for plan views, elevation drawings to DXF. Support points for struts in plan-view. Provide intermediate supports in the 3D plan view for struts to reduce the unbraced length. Reductions in axial loads on walers (3D). Reduce the axial force on walers due to static friction. Improved report output: Condensed quick input/output summary. Improved 3D Frame Analysis module. Structural Steel Code Updates: AISC 2016. New Wall Types: Secant walls with different reinforcement for main & secondary piles. Automatic optimization with depth change for supports. DeepEX will vary the support elevation to achieve minimal wall moment, or cost (for 1 support level). Distribution load approach on surcharge for 3D loads. Base resistance for wall embedment safety factor calculations when embedded walls are end bearing. Inclined walls from vertical axis. Additional options for recent CIRIA C760 publication such as geotechnical axial capacity of walls. New water flow analysis options. New module: Finite Element Analysis. New software: HoloDeepEX (holographic representation of 3D models created by DeepEX 3D Frame Analysis module). Speech recognition commands and interactions. User can use speech commands to access quickly partial software dialogs, perform changes on the model (excavation/backfill operations, water elevations etc), as well as, command the software to create a model automatically, describing the excavation depth, support type and number of supports. The model with all staging can be generated in seconds. Timber piles, box sheet piles, composite walls. Direct input of SPT and CPT test records and soil property interpretation. Expanded slope stability options. New slope stability analysis method added. Structural code and steel member updates. Chinese Standards (structural and geotechnical) are implemented. New module: Damage assessment for surrounding buildings. The linear external loads are now taken into consideration in the conventional analysis. Model Hydraulic and Mechanical struts. In some countries, hydraulic and mechanical struts are very popular. These struts can be assembled by joining a main strut section together with a hydraulic piston or mechanical jack. Transition strut sections are attached on the main strut section towards the strut ends. DeepEX incorporates some commonly used mechanical and hydraulic struts and considers particular design aspects. New conventional analysis and surcharge calculation methods. DeepEX now offers two additional methods for calculating the effect of surcharges on the wall with the distribution angle approach. Arch modeling for the Non-Linear analysis. The non-linear analysis is improved on by including arching capabilities. The arching has been verified and compared against a series of finite element simulations. Arching reduces the wall bending moments and loads on the lowest struts, while increasing the load on the top struts or braces. Structural codes update – AISC 360-10, Australia and New Zealand AS 3600, ACI 2014. New module – Export drawings to DXF. The drawings offer great detail and save significant time. The export allows to generate cut sections, with stages included in sequence, illustrating what new is happening on each stage. New wall friction options. DeepEX 2016 allows to model different wall to soil friction angle between the excavated and the retained wall side. New water pressure method. The balanced water pressure method is introduced. In the balanced water pressure method, hydrostatic pressures are assumed down to the lowest water level, and the water pressures balance out at the wall base. Thermal effects for struts and rakers. Thermal loads can be included by assuming a temperature difference and an adjustment factor. Accidental loads for struts and rakers. Accidental loads can be incorporated for struts and rakers (such as from accidental excavator or backhoe impact). Sheet pile corrosion. DeepEX includes capabilities for modelling corrosion of sheet piles, following standard procedures described in EN 1993 with varying corrosion rates. New wall types. DeepEX now implements secant piles with double or triple unreinforced piles, T-panel diaphragm walls and gravity walls. New conventional analysis method pressures. DeepEX gives the option to model lateral earth pressures between Ka and K0. Rowe’s moment reduction method on free earth moments for cantilever walls. In DeepEX 2015 you can use your mouse in order to modify the soil surface or water tables elevations. We can take the mouse over the ground surface, press and hold the left mouse button when the surface highlights and move the surface elevation with the mouse. We have improved the wizard making it more intuitive. We can now select the type of excavation to be modeled directly from the wizard. In 2015 version, we can trace one of the graphs with the mouse and the value at the elevation will appear on your screen. The 2015 version offers new options for limit-equilibrium analysis. One of the options is analyzing the wall beam with a simplified approach where negative moments can be applied. The percentage of negative moments can be defined by the user.